The course borders Lake Washington, the Washington Park Arboretum, and the Broadmoor residential neighborhood. Vistas of Lake Washington, the University of Washington, Laurelhurst and the Cascade Mountains are seen from many of the holes on the course and from the clubhouse. 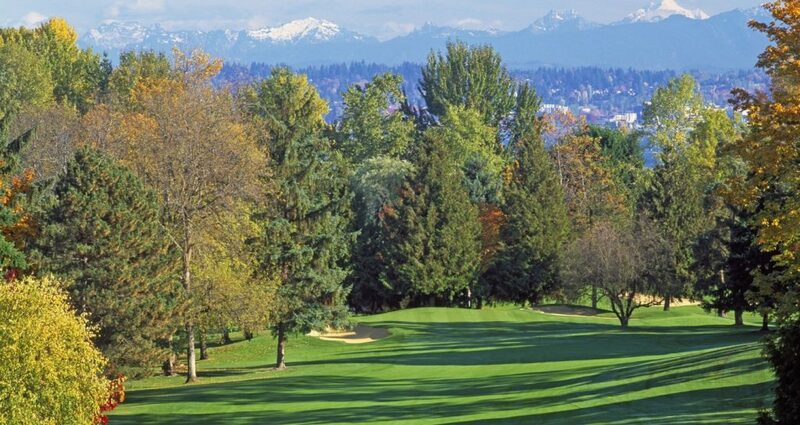 The Fairways are lined by Douglas-firs, creating a peaceful experience and making it difficult to imagine that one is so close to a major urban center. The course is endowed with a naturally undulating topography which is endlessly interesting to play for golfers of all abilities. It is an easy walk as the greens are near the next tee in a traditional parkland style. The greens run true and provide complex puzzles that enhance the golfing experience. It is a course that can be played every day, keeping every level of golfer’s interest in its classic architecture, and requiring thoughtful shot making decisions. Broadmoor has practice facilities which include a putting green, driving range for full shots and areas for short game practice including chipping and sand shots. The fairways and greens are kept in immaculate condition by Golf Superintendent Sean McDonough. A commitment of creating a premier golfing experience in the Northwest is echoed in the Club’s Mission Statement as well. Broadmoor has adopted Master Plans for the golf course and the clubhouse to maintain and improve the classic character of the facilities. In 2006, a Golf Course Master Plan was approved by the membership, which included a state of the art Turf Care Center, a new irrigation system and ongoing course improvements which enhance the key strategic and visual characteristics of the course as well as improve shot values, aesthetics and playability.